The 9600 Series from Gammaflux provides the same control as the company's industry leading 9500 Series; but unlike the 9500 Series, which is a floor-standing system, the 9600 houses all of the components in a specially constructed machine cabinet. The cabinet is designed to be mounted on the injection molding machine, saving the molder valuable floor space. In addition, the 9600 features a remote monitor that can be mounted at an optimal location, such as alongside the machine's operator panel, to allow convenient, easy access. 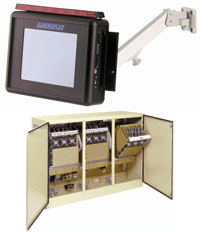 The monitor features the same touch-screen capabilities as the 9500 Series for simple controller operation. "This system was developed after we received requests from several customers that this would be a valuable product," said Rene Bertschi, Managing Director of Gammaflux Europe GmbH in Wiesbaden, Germany. "We were approached by a customer in Belgium and asked to provide the 9500 Series controller without the standard floor-standing cabinet. With engineering and manufacturing help from Gammaflux's Rockford, IL and Sterling, VA facilities, the controller racks were wired and mounted on a base plate. After shipment to Wiesbaden the unit was assembled into a housing that could be positioned in front of the injection molding machine with a new remote-mounted computer monitor and touch screen. Five of these systems are currently up and running in Europe, and we are now making the 9600 available worldwide."